Don't fret if you've never done it before, making pasta from scratch is actually quite easy and the result is far superior to store-bought. 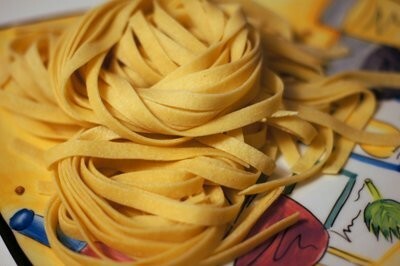 That's especially true of thicker and wider types of pasta shapes like fettuccine, pappardelle and the like. 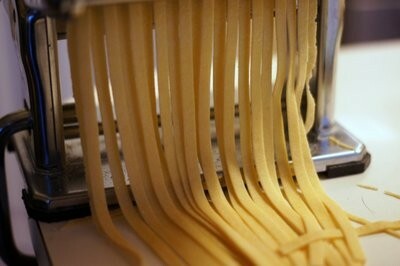 An added bonus to the great flavor and texture of fresh pasta is it's quite inexpensive to make. Unlike baking, exact measurements aren't critical for making pasta. A lot depends on the humidity of your kitchen, the type of flour you use and so on. After you've made pasta dough once or twice, you'll get a feel for how its done and can improvise and make corrections if the pasta is too dry or too sticky. This is my all-purpose recipe for making dough for egg pasta or noodles. I like the texture of the pasta when using two different types of flour, but you could just use all-purpose, unbleached flour if you'd prefer. This recipe will make about 1 1/2 lbs. 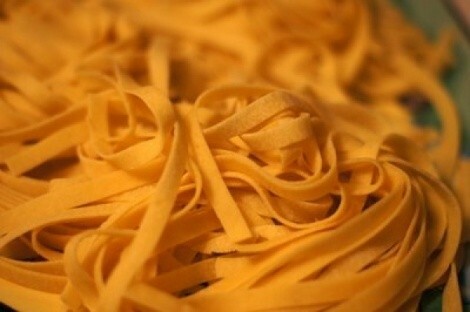 of fresh pasta - enough for 4 generous servings. *Note: I usually weigh the flour rather than measuring it in a cup. If you prefer that method, 7 ounces of flour equals 200 grams. 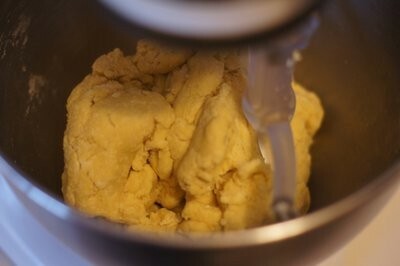 I normally use a KitchenAid stand mixer with a paddle attachment to make my pasta dough, but you could also do it by hand using a large mixing bowl and some elbow grease. 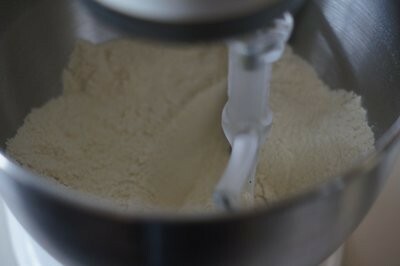 First, place the semolina and all-purpose flour together in a mixing bowl and mix at low speed until blended. 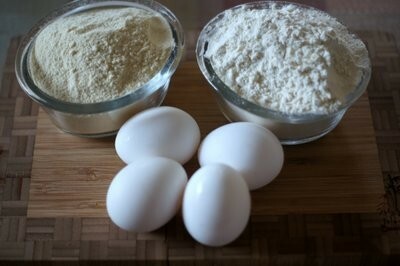 Make a small well in the center of the flour for the eggs. 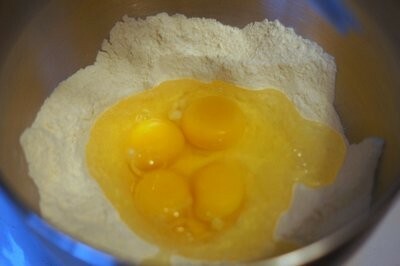 Mix the flour and the eggs until the dough comes together and no longer sticks to the sides of the mixing bowl. The dough should be only slightly sticky. If it's too wet and sticky, add a tablespoon or two of extra flour. 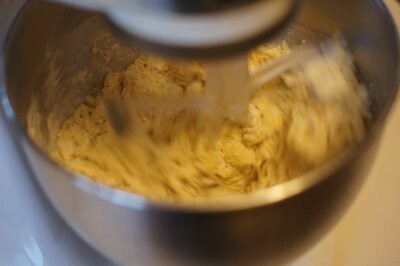 It the dough is too dry and doesn't come together properly, add a tablespoon or two of water and continue mixing. 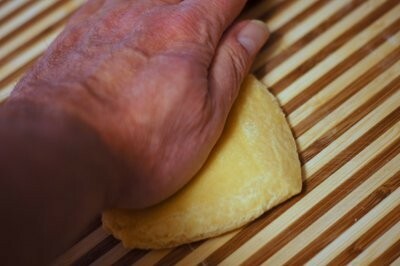 Knead the dough by hand for a couple minutes and form the dough into an oval shape. If the dough is too sticky, dust with a little flour. 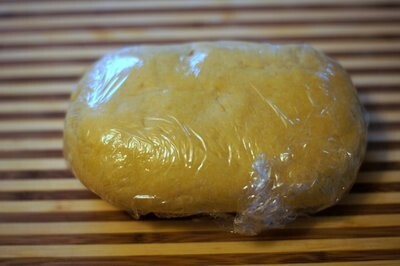 Wrap the dough in plastic wrap and allow it to sit for 45 minutes to an hour at room temperature. At this point you can make your pasta. 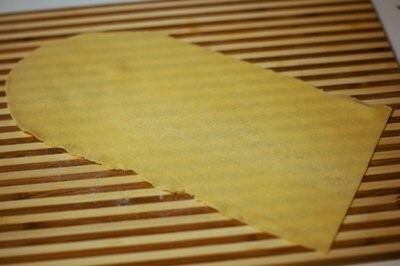 You could roll the pasta dough out with a roller and cut the pasta by hand. 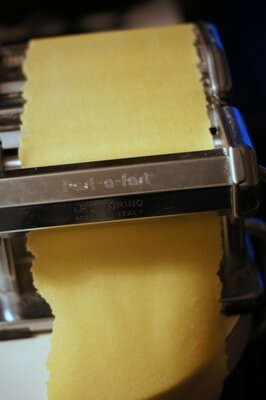 I prefer to use an inexpensive hand-cranked pasta machine to roll out the dough and to cut the pasta. 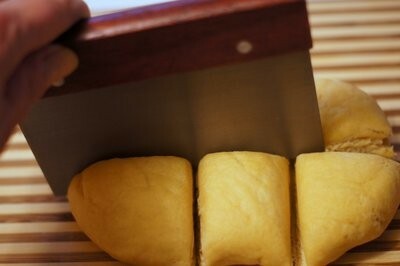 On a lightly floured cutting board, cut the dough the dough into six pieces. Cover the pieces with plastic wrap until you're ready to use them. Using the palm of your hand or a wooden roller, flatten one piece of the dough out until it's thin enough to fit through the widest setting of the pasta roller. 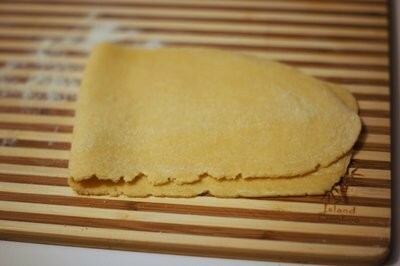 Roll a piece of dough through the machine, then fold in half and repeat.If the pasta sheet sticks, simply sprinkle a little flour on it and continue. Keep rolling out the pasta dough, adjusting the roller to thinner settings until you have the pasta thickness you like for the type of pasta you're making. When the pasta sheet is the right thickness, run it through the pasta cutter set for the pasta shape you want: fettuccine, spaghetti, etc. Or, simply cut the pasta by hand. I usually cut it by hand when I'm making pappardelle, lasagna noodles and such because my pasta cutter attachment doesn't have a wide enough setting for those. Repeat rolling and cutting the pasta with the remaining dough pieces. 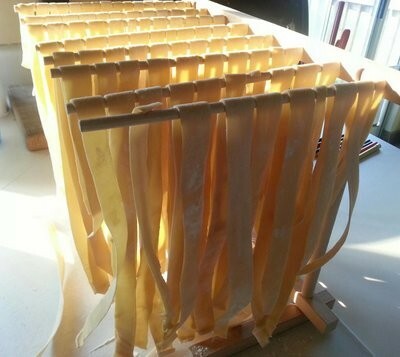 You can use the pasta immediately or you could dry it using something like the wooden drying rack pictured here.